I finally made the lentil version of the chickpea & veg stew that you helped me with a few weeks ago. Fry the onion & garlic for a few minutes. Add the chorizo, let it colour the onion. 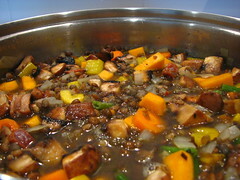 Add the carrot, yellow pepper, squash, green beans, mushrooms. Fry more. Add the lentils, stock, tomatoes. Season and add tomato paste. Simmer for about half an hour. I served with pasta yesterday and couscous today. Both worked. It's sort of meaty. Due to the lentils, I reckon, rather than the chorizo.